Ready to try surfing? We can help! 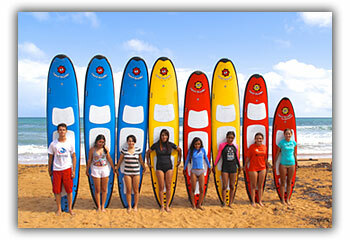 We offer surfing lessons for ages 8 to 80! If you're staying near San Juan, Fajardo, Luquillo, or anywhere on the east or north coast, Luquillo is the place for surfing and La Pared beach is the spot. Here is where we begin our lesson which will get you comfortable with the proper techniques and positions. After we get the basics down we'll get you in the water. All of our instructors are licensed, local, and CPR/first aid certified. We make Puerto Rico vacations betters! Please notify us immediately of any changes or cancellations to your reservation. Reservations not cancelled within 24 hours of the scheduled lesson time will be subject to a full payment. The credit card used to guarantee your reservation will be charged the total amount.Note: All changes or cancelations must be through phone. If you sign up for a tour you are acknowledging that PR Vacation Helpers is not responsible for any accidents. We have never had any issues, don't be the first!